'Tis the Season.....here we go! 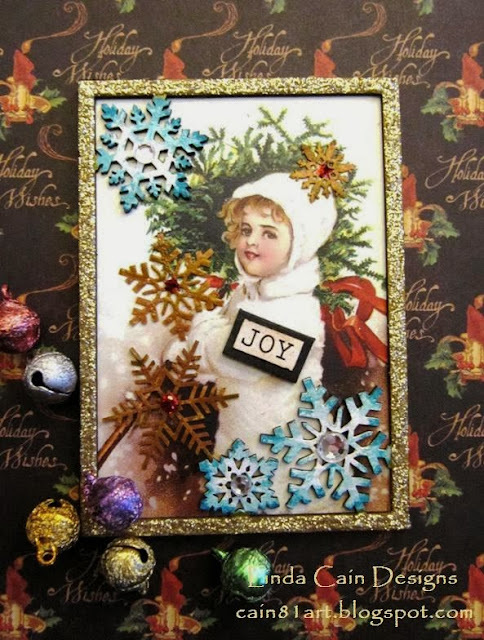 I wanted to use the terrific Cabinet Card from Tim Holtz in a card with all the Christmas Dies I could find....so I just spent a few hours cutting out a whole bunch of paper and chipboard pieces. When they were all piled on my desk, all over the place, I was ready to play. Just sit.....and play! All the die cutting was done! No excuses! Well, needless to say, I LOVE how this turned into a Vintage Christmas Card with just a bit of glitter. I'll share the high points, and you can get going on your own. This Lamppost is cut out of a scrap of Glossy Cardstock that I'd added Alcohol Inks to ages ago. The Gold Metallic is probably used with Browns, Greens and a Blue. It's just a guess. I also cut a piece out of black cardstock and glued it slightly to the right to create a shadow. Edge with a Black Sharpie. I used a piece of yellow scrap to add some Orange Distress Markers for a lit-up effect. The NOEL is cut with gold cardstock. I used Glue-n-Seal with the brush and the Tarnished Brass Distress Glitter....very Vintage looking, I think. The Wreath is cut from a piece of scrapbook paper with at lighter leaf and flower design. I used a sanding block, Distress Pens, and Distress Inks on it. The Bow is just plain cardstock with Distress Inks and Distress Pens to add detail. The Gold Glittered Pearl looks good in the center. After if was all laid out, I wanted a bit more GLITZ, so I added some Rock Candy Distress Stickles to the Wreath and Bow. The Lamppost comes with Holly Leaves, but they seemed to blend in too much with the Wreath, so I used a piece of the the Pinecone Die's Leaves to go with the Holly Berries. Add some white pen to make it stand out better. Tone it down with Vintage Photo Distress Ink. I tore the back off the Cabinet Card and distressed the edges all around. Layer it onto a Black Card and the whole thing kinda pops! All these supplies are available right now at Inspiration Emporium, so check them out soon! As some of you know, the Central Illinois Tornado hit the communities on both sides of us this past week. We are feeling so incredibly fortunate not to have any damage, but our friends and relatives have lost everything in some cases....too many cases. So I decided I needed to express myself in my Journal...I'm thankful and full of hope from the outpouring of help and volunteers that have flooded into the area. I hope they realize that the Journey has changed course, but there are so many people willing to help them along the way. This is in my small Dylusions Journal. I started with Distress Inks and Blending Tools. I embossed the Texture Fade onto some manila card, painted it white with acrylic paint and the sponged on some various shades of blue. When it was dry, I sanded it down to expose the white paint. Layer up several stencils in different areas with paint and inks. I die cut Tattered Leaves with Core'dinations Distress Collection papers. Then I used an embossing tool to add veins on the backside, and sanded the front. Ink, pens, stamped splotches with Distress Ink and embossing with Gold UTEE makes the leaves come alive! I added Stencils, Stamps and Pens to the background in layers. Use Archival Inks to make vibrant. 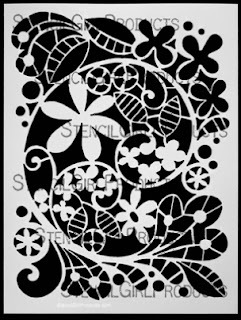 Layer the embossed words onto black cardstock. I love the Autumn colors here. With Thanksgiving right around the corner, I'm full of Hope and so very Thankful for everything. Check out the links below for products I used. Time for another StencilGirls Talk Blog Hop. 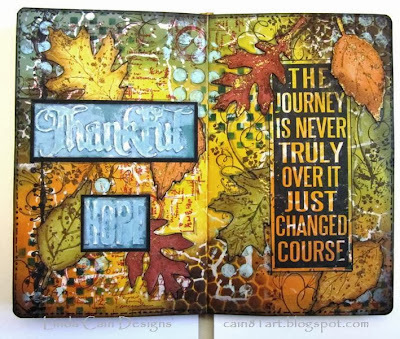 The double Journal Page below is the result of several layers with 2 gorgeous stencils and lots of Sprays, Inks, Stamps and Pens. I started with the large Dylusions Journal and Dyan's Sprays. Then I used the Garden Swirl and Layered Salad stencils by Terri Stegmiller. This shows some of the Distress Inks over the sprays as well as a bit of the white pen. I wanted MORE color, so at this stage I also added brighter colors such as Mustard Seed and Picked Raspberry Distress inks to fill in and brighten things up. 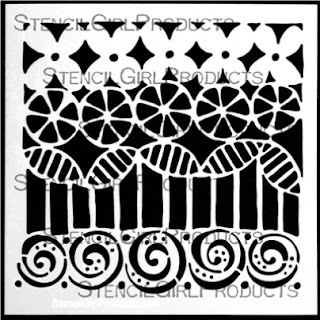 I used various Borders, Swirls and Splats stamps from The Artistic Stamper and more stenciling using white paint. I really love the way the white paint picks up the color of the inks and lets you see the layers underneath!!! VERY cool IMHO! I just continue to add Glaze Pens and Sharpie Poster Paint Pens. I wanted a focal point, so I felt the gorgeous Kiki from Neil Walker that I'd stamped and colored earlier would be perfect in this "garden" atmosphere. So I cut her out and glued her into place. A perfect combination I think. The last thing I do is use markers to add more subtle tones to some areas of white and shadows to make other spots jump out a tad. That's it for me. Don't forget to leave a comment here and jump to all the other blogs playing along today. Each comment enters you into the drawing that ends Nov. 24th 11:59 PM Central Time. We finally got our internet up and running moments ago! The electricity came back on just before Midnight on Sunday, so we're feeling extremely grateful for not being in the path of the tornadoes that hit the next towns over from us..Washington, Illinois and Pekin, Illinois. We were basically an untouched town sandwiched in between the two...it must have hopped over us! If you can find a way to contribute to the Red Cross or other relief funds to help these devastated areas of our community, please do so. Many have absolutely nothing left but the clothes they were wearing. Thanks, and now I'll show you what I had all set to upload, thankfully, before the storm. I know, it's that time ALREADY? Yep....it'll be here before we know it, so let's get going and make some fun ATCs that can be loaded onto a card...or just sent as is!!! Isn't this little vintage beauty just too sweet not to love?!?! I've used the ATC Frame-Snowflakes, Christmas Collage Words, White Snowflake Paper Cuts, and Collage Sheet Christmas Magic here all from Retro Cafe Art. I painted the white paper Snowflakes with Tarnished Brass and Antique Bronze Distress Paints and added a dot or Red Stickles in the middle. The frame Snowflakes are painted with Fresco Paints and a clear Rhinestone in the middle adds some shine. The frame has Gold Stickles all around it. This one is done with the Christmas Sweeties Collage Sheet, the ATC Frame-Christmas Trees, the Christmas Collage Words, Gold, Christmas Red, Copper, and Turquoise Stickles, and some Snow-Tex with Green Acrylic Paint on the trees. The little Mini Glitter Jingle Bells are just too cute to leave out. You could easily mount these onto the Graphic 45 papers shown here and send as cards, or just sign the backs as a Christmas Card that you could send with a Mini Easel Clear or the Masonite Easel. Either way, it would be a wonderful keepsake that is easy to mail and cherish for years to come. I'm just sayin'..........check out the links; have some FUN...and Create ART! I had so much fun working on this little Votive House Shrine #5 from Retro Cafe Art Gallery!!! So many wonderful little pieces here from Kristin, the sky's the limit! My dear husband took out the tree today and put it up for me, something I usually do, but I didn't want to get any of the dust from the attic in my eyes....what a guy! A little step-out here....I laid out all my pieces for 2 houses and base coated Snowflake Fresco Paint, then added several different colors from Haystack to Blood Orange from PaperArtsy. Next I stamped with some terrific little Mini Christmas 1 and 2 Stamps from The Artistic Stamper using Archival Inks. These Stamps were PERFECT for the little houses!!! This is all for the inside...I set it up and liked what it looked like, so I started on the outside. These Pine Tree Cut-Outs and Christmas Word Scroll Cut-Outs from Coffee Break Designs are base coated and them glittered up. I also did a Blue Glittered Snowflake Cut-Out later that I decided I NEEDED! The roof is painted Green and then I layered rows of German Dresden Scrap to create the shingled look. The Mini Border Gold is at the top. Here you can see the Irish Creme on the outside with various shades of brown added to the edges. Then I stamped the Chickenwire Stamp with Sepia Archival Ink and colored a few spots with red pen. I also outlined the windows with a Sharpie. The Mini Glittered Jingle Bells (aren't they adorable?) and little Bottle Brush Tree are from RCAG, too. Just laying it out at this point. I added the White Snowflakes later to brighten up the outsides. These Snowflakes are WONDERFUL! The detail on them is really amazing!!! This is the back. You can hang it on the tree and let the lights shine through, or put a Battery Votive Candle in it and set it on a tabletop. More glitter is added to the scroll eves that come in the kit, and around the back edges. Last is some white pen marks to break up the color....of course. The hole is already drilled for you to put a piece of gold cording or ribbon through to hang on your tree. Kristin thinks of everything! So follow the links and order some fun to make your own little treasure, or get busy and make for gifts!!! Since I recently had minor eye surgery that will need time to heal (4-6 weeks!) and then new glasses after that (yuck) - my posts will be short and sweet for a while! Having said that, I'm just thrilled I can see well enough to create a few things right now! This tag has a lot of products on it and layers of goodness. So check out the links below and I hope you're inspired to play. I used a #8 Manila tag and applied Distress Inks as a light base, and then added darker colors over the Burlap and Clockwork Stencils. Pen marks and stamped images from Classics #1 set and Steampunk were next. The Voyage stamp is added with white paint. Just a note: the O didn't stamp well, so I painted it in by hand....hence the difference from the stamp for those of you with a good eye! Here is a detail shot of the stamping and stenciling. I love the Tissue Tape layers and Industrious Stickers. The Compass Coin has white paint added to enhance the engraving and a game spinner/mini gear make the center. My eye is getting better every day! Thanks for all your well wishes, they meant a lot. Eye 2 is set for Monday!!! Take care and be good to each other! Tim Holtz - Distress Inks - Spiced Marmalade, Ripe Persimmon, Mustard Seed, Squeezed Lemonade, Black Soot and Pine Needles. Tim Holtz - Stencils - Clockwork and Burlap. Tim Holtz - Idea-ology - Game Spinners, Mini Gears, Compass Coins, Tag Labels, Linen Ribbon, Industrious Stickers-Borders, Tissue Tape-Laboratory. It's been quite busy around here lately, but I finally found some inspiration and time to make a couple of things! 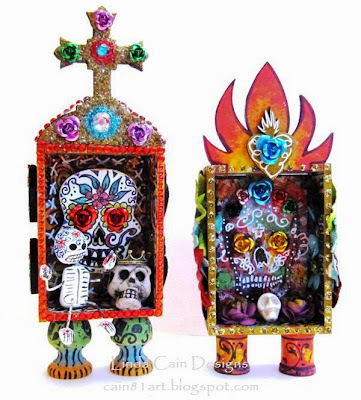 These are for the Dia De Los Muertos Mini Shrines Swap at Retro Cafe Art Gallery.... commonly called Day of the Dead. I have to admit, these were not in my wheelhouse, so to speak, but once you get going with all the fun pieces and colors, you just get sucked in!!! According to Wikipedia, the DOTD, November 1st, is the 2nd day of 3 to celebrate the dead...All Saints Day. Kristin sent me a great link that explains how this holiday is celebrated all over the world in honor of loved ones who've passed on. This little Mini DOTD Skeleton Figure sitting in the Tall Classis Church Shrine and the Seniorita Sugar Skull are decorated with extra-fine Sharpie Markers. The eyes have Red Mini Metal Roses glued on. I used Distress Glitter on the top and Glitter Glue on the tiny Flaming Hearts, with Distress Paints on the rest of the piece. The Rhinestones are added around the edge and pushed into the glitter on the top. The Antique Brass Crown fit perfectly on the larger Skull bead I found on vacation. The background Swirls stamp I used all over this piece was just perfect from Neil Walker at the Artistic Stamper. This Flame Arch Shrine is painted in the same way and stamped, but the inside is stamped with the Tim Holtz Skull from the Mini Halloween Collection 3. Large paper flowers are layered and sprayed with Perfect Pearl Mist. The Mini Mulberry Flowers inside have a touch of Viva Gold added and placed beside the Ivory Carved Stone Skull Bead. The Flame on top is painted with Fresco Paints, and of course the White Extra-Fine Sharpie Pen is added for accent. After painting a base coat of white on the pieces, I just randomly dabbed the Distress Paints all over the sections on both sides. Then I stamped with the background stamp and Jet Black Archival Ink. It's easiest for me to paint and decorate before I glue it together....that's what makes these projects so fun. This shows the various paper flowers, one with a sequin flower in the middle. The back has to have your name on it for the person who gets it in the Swap to know who it came from, so I added the Flaming Hearts with glitter glue and a signature. The wooden spools and funky legs were painted and either stamped or decorated with permanent markers to add some height. There's still time to get your DOTD Shrines in for the Swap with the deadline of Nov. 11th, so check out the links and just have some FUN!